Both wasps and honeybees are flying insects that might sting you if you get too close. Some wasps bear a resemblance to honeybees, but the similarities end there. Bees and wasps have many differentiating characteristics that will help you identify which is which. Common honeybees belong to the species Apis melliferia and fall under the Apidae family of insects. 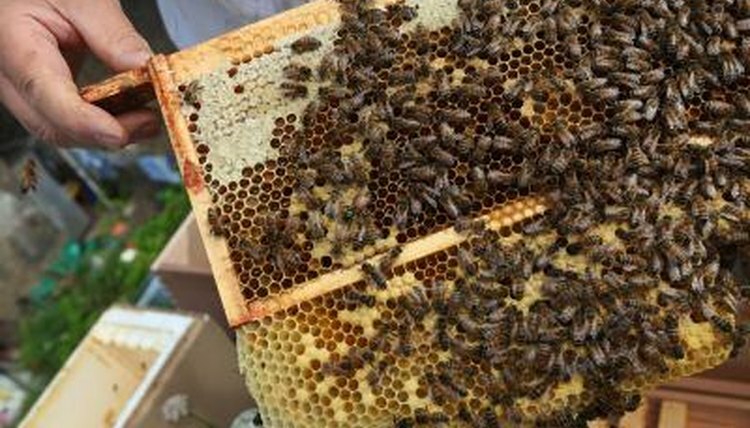 There are three types of honeybees: worker bees, drones and queens. Worker bees are the type that are most commonly seen by people in the wild. Workers are undeveloped females that gather pollen and nectar and bring it back to the hive. Honeybees produce honey and beeswax which are harvested by humans for commercial uses. A typical honeybee is 5 to 15 millimeters in size. They are a golden color with black stripes. Their body is covered in a very fine fur. Honeybees are social insects that live together in a hive constructed by wax, which they secrete from their bodies. Commercial honeybees build hives in manufactured sites, while wild honeybees typical build hives inside cavities of large trees. Wasps are the name for various species of the order Hymenoptera. There are more than 30,000 species of wasps. Some species are social insects that live together in nests, while others are solitary. Not all wasp species are capable of stings, while others produce a very painful sting. Wasps come in a large variety of colors and sizes, but one thing they all have in common is nest building. Wasps use wood fibers to build their nests. Yellow jackets are a species of wasp that most closely resemble honeybees because of their black and yellow color. Yellow jackets are a stinging type of wasp and they build their nests underground. They are also social wasps and often will swarm when they feel threatened. Adding to the danger, yellow jackets can sting multiple times, unlike honeybees that will only sting once. The easiest way to tell the difference between honeybees and wasps is by their appearance. Most wasps have slender bodies with narrow waists. They come in many different colors, but most of the time have a smooth and shiny appearance. Honeybees, on the other hand, have thicker bodies and are covered with very tiny hairs. They also have a distinct gold and black coloration. At first glance, yellow jackets might look like honeybees because of the coloration, but like other wasps, yellow jackets have skinny waists and smooth bodies. Colorado State: What is a Wasp-Hornet-Yellowjacket-Bee? Is a Yellow Jacket a Wasp or Hornet?